Get Tickets NOW! — CLICK HERE!. Updates on the Facebook Event. Steve Gardner brings his decades of performances with Culann’s Hounds and a reputation for stage shows filled with mash-up of tradition and energy drawn from folk melodies drawn of Ireland, France and early America. With seeming effortlessness he plays Irish traditional music, Cajun, country and rock, pairing with his bandmates at breakneck speed. At once thought provoking, accessible and infectious, Steve’s virtuosic violin style is clean and uncut, and when he grabs his guitar and sings, he brings his own irreverent style to both classic and original songs. To watch their Videos, CLICK HERE!. Kyle Alden is an award-winning singer/songwriter and folk musician recognized for his Irish traditional guitar accompaniment, Kyle has several issued several albums of original work and supported many top players in concert, including Gearóid Ó hAllmhuráin Tommy Peoples, Paddy Keenan, Mairéad Ní Mhaonaigh, Liz Carroll, Athena Tergis, Andrew McNamara, Tony De Marco and Ann Kirrane, among others and has appeared on stages throughout the western US and Ireland. Born in the Philadelphia area, Timothy Hill has spent the last decade studying and performing Irish traditional music. Tim started his career with Irish music on bodhrán, and at the age of 11 took up the uilleann pipes. With years of tutelage from John Donnelly, Jerry O’Sullivan and Tim Britton, and performances with Mick Moloney, Paddy Keenan, Teada, Billy McComiskey, Tony DeMarco, Seamus Begley, Gabriel Donohue to name a few, Tim has become one of the top young pipers in America. 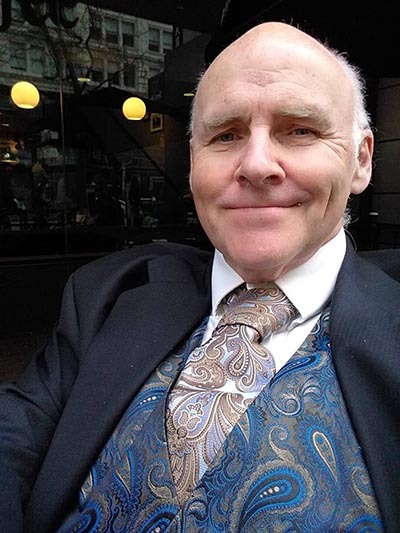 Irish Voices and Donagh Mc Keown are pleased to announce that the Irish Influence in San Francisco Walking Tour is going on an extended walk to San Jose on this upcoming St. Patrick’s Weekend. In association with AmeriCeltic, we are proud to present a special talk on some of the Irish Heroes and Villains who helped form San Francisco and San Jose. The talk will be a donations only event. 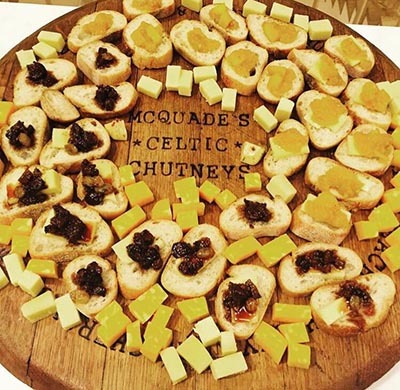 Check out McQuade’s Chutney’s, at McQuade’s Celtic Chutney on Facebook. The Santa Clara Valley Fiddlers Association is a non-profit organization dedicated to the preservation of traditional types of American music such as Celtic, old-time, bluegrass and gospel music, as played on the fiddle and other compatible acoustic instruments. 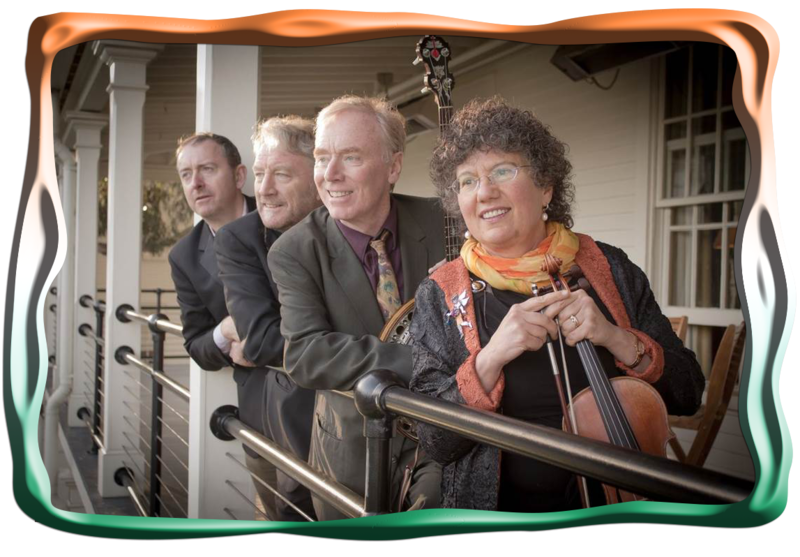 Their public outreach performance band, The Santa Clara Valley Fiddlers, will entertain us with an hour of Celtic and related old-time tunes. 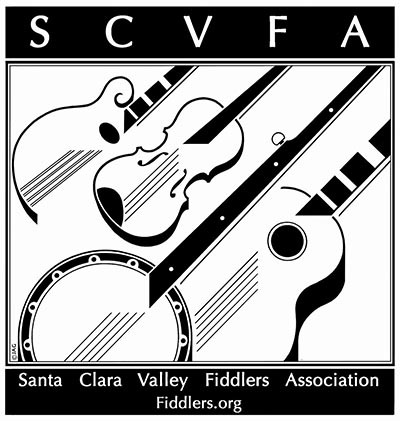 Check out The Santa Clara Valley Fiddler’s Association, on the SCVFA’s Website or SCVFA on Facebook. Never pre-recorded, always immediate and created fresh, the masterful Michael Mullen makes live looping an art form. Experiencing this solo musician building his TriaSoli ‘ensemble’ group gives the audience a unique and powerful connection with old chamber favorites – You may have heard them a thousand times, but never like this. Then, in Trio of One, the Mullen brings to life the music of his Celtic roots, creating a full band while you watch and listen. In the end, you’ll understand why his old Tempest bandmates dubbed him The Mad Fiddler. See Michael’s videos, Click Here! Celebrating more than 30 years of Celtic Rock! 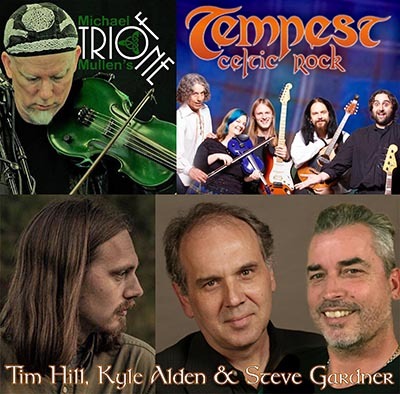 World-famous Tempest needs no introduction — close out your Saint Patrick’s Day fun while grooving to Celtic Rock with flavors of Scandinavia, India, Africa & Arabic Nations. In its 13th year, the Winterdance Celtic Christmas Celebration for 2018 AmeriCeltic presented on Friday, December 14th at 7:00 PM, at the Hoover Historic Theatre, 1635 Park Ave., San Jose to a Sold Out audience of over 200. 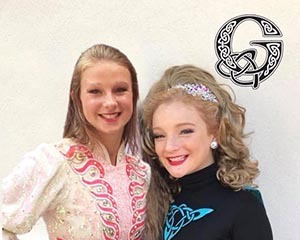 The program featured the renowned Celtic band Molly’s Revenge: https://mollysrevenge.com, vocalist Amelia Hogan, and The Rosemary Turco Irish Dancers. Co-sponsors AmeriCeltic.net: https://americeltic.net, the Santa Clara Valley Fiddlers Association: https://www.fiddlers.org, South Bay Scottish Society: http://southbayscots.org and the Saint Andrews Society of SF: http://saintandrewssocietysf.org, each provided reception tables with staff to greet and discuss their services with the public. The Program included a raffle of Premium Events and Gift items which benefited the victims of the Camp Fire Wildfire, and more than $1000 was sent to the North Valley Community Fund https://www.nvcf.org. GRAND PRIZE $240 value – as Seen on PBS, and all around Northern California, 4 premium main floor seats at the stage show An Irish Christmas, Thursday, December 20th, 7:00 PM, at the Mountain View CPA, from Kerry Irish Productions. Includes meet-and-greet with the performers, including Irish Step Dancers Caterina Coyne and Connor Reider of RiverDance and World Champion Tyler Schwartz as well as 5 show CDs. $120 value – 4 tickets to the ABBA MANIA show on Saturday, March 9, 2019 8pm from The Flint Center, Cupertino. $120 value – 2 gift tickets to 25th Annual Burns Night, Saturday, January 19th, 4:00 PM @ Mountain View Masonic Temple from South Bay Scottish Society of San José. $120 value – 2 gift boxed wines, 2016 Arroyo Seco Chardonnay and 2016 Paso Robles Cabernet Sauvignon, each 1.5 liters, from J. Lohr of San José . $50 value – 2 tickets to the Wake the Dead show Friday, March 22nd, 2019 in Gilroy from Wake the Dead. $40 value – 1 liter bottle of Jameson Irish Whiskey from O’Flaherty’s Irish Pub, San José. $40 value – 2 tickets to Frankie Gavin House Concert, Sunday, February 10th, 8:00 PM , from Cope-a-cabana, San José. $36 value – 4 passes to The Rosicrucian Egyptian Museum, including the new Medieval Alchemy Exhibit from Rosicrucian Park, San José. $30 value each – 2 Gift Certicates, each worth a pair of tickets up to $30 value to Show of your Choice at Art Boutiki, San José. $30 gift card for Britannia Arms Almaden, San José. $25 value each – 2 Gift Cards, worth $25 each, from Scrambl’z on the Alameda, San José. $25 value – One 1.5 lb. Fyne Traditional Christmas Pudding, steamed to perfection and stuffed with with fruit, with a touch of Guinness and dark rum, from Artisan Candies, San José. $25 value – Two Piece Traditional Christmas Centerpiece and Wreath, from Barb Pesavento, of San José. On Friday, March 9th in San Jose at 7:00 PM, The Black Brothers Band returned to San Jose, generously hosted again by Trinity Cathedral, 81 N. Second Street, San Jose, bringing The Biggest and Best St. Paddy’s Show in the South Bay with with Special Guests Moonshine Jelly and Greene Academy Dancers! Exciting world folk band Moonshine Jelly opened for the BBB exclusively at the San Jose appearance. Sarah Buchinski and Kate Behan from The Greene Academy of Irish Dance greene-academy.com added a graceful and flashy Irish Dance performance. The program was made possible in part by the Harold R. Hayes fund was co-sponsored with the San Jose Dublin Sister City Program and benefited their Pat McMahon Masters Level Scholarship Fund. At 7:00 PM on Friday, December 15th, 2017, at Trinity Cathedral, 81 North Second Street, San Jose Molly’s Revenge, featuring David Brewer, John Weed and Stu Mason with stunning vocalist Christa Burch of the Syncopaths, and the award winning Rosemary Turco Irish Dancers Nickie Crofts, Rachel Downey and Sammi Powell, presented an evening of music, song and dance associated with the festive season. The performance included Christmas songs both old and new, all played with a Celtic twist, and something new for our regulars. 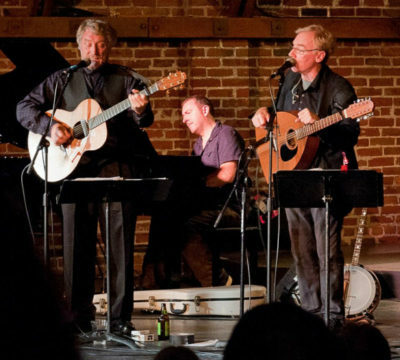 On Friday, March 3rd in San Jose at 7:00 PM, The Black Brothers Band returned to San Jose, proudly presented by The San Jose-Dublin Sister City Program, and generously hosted by Trinity Cathedral, 81 N. Second Street, San Jose. The performance was made possible in part by the Harold R. Hayes fund with proceeds benefiting the Pat McMahon Scholarship Programs of the San Jose-Dublin Sister City Program. At 7:00PM on Friday, December 9th, 2016, at Trinity Cathedral, 81 North Second Street, San Jose Molly’s Revenge, featuring David Brewer, John Weed and Stu Mason with stunning vocalist Christa Burch of the Syncopaths, and the award winning Rosemary Turco Irish Dancers presented an evening of music, song and dance associated with the festive season. The performance included Christmas songs both old and new, all played with a Celtic twist, and something new for our regulars. California and the Easter Rising Final from Irish Voices on Vimeo. 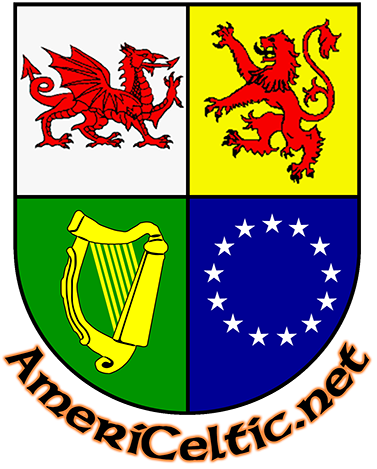 For six years, from 2011 through 2017, annually in mid-December, AmeriCeltic co-sponsored this live, traditional Irish music concert with the San Jose-Dublin Sister City Program. All of these were generously hosted by Trinity Cathedral, 81 N. 2nd Street. These six Annual WinterDance Tour concerts featured Molly’s Revenge, starring David Brewer, John Weed and Stu Mason and stunning guest vocalist Christa Burch with the Rosemary Turco Irish Dancers, presenting an evening of music, song and dance associated with the festive season. The San Jose concerts often included an opening performance by new talents, such as on Friday, December 11, 2015 7:00 PM, when the Concert was opened by three members of the Santa Cruz collective, Charmas, Richard Dwyer, vocals, low whistle and bodhran, Aaron Clegg, vocals, Celtic wooden flute, Jim Powell, backup vocals and guitar. These performances were all made possible in part by the Harold R. Hayes fund with proceeds benefiting the Pat McMahon Scholarship Programs of the San Jose-Dublin Sister City Program. On Saturday, April 18, 2015 @7:30 PM at Prospect HS Performing Arts Center, 18900 Prospect Road, Saratoga CA, the San Jose Dublin Sister City Program presented Story Road progressive traditional Celtic creations in partnership with AmeriCeltic. After forming in 2012, Story Road quickly emerged as a leading traditional Irish band on the West Coast, convening twice a year for spring and autumn tours that delighted trad music fans from Santa Barbara to Seattle. Their live show ranges from driving dance tune medleys to heart breaking songs of love and immigration. This year’s presentation promises a taste of Americana as well, and a singalong or two in the mix. 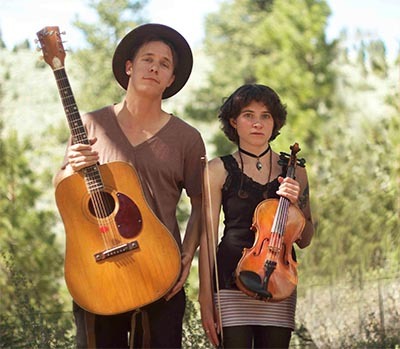 This all-star Band line up includes Portland, Oregon’s stunning Colleen Raney, of Seattle’s celebrated Raney Family, and two-thirds of Molly’s Revenge, accomplished cross genre fiddler, John Weed and veteran multi-genre instrumentalist Stuart Mason. Joining these three founding band members is Hanz Araki, the master singer and traditional flute player in the Pacific Northwest for more than 2 decades. Photo copyright © 2012 Lawrence Whitcomb Photography Licensed for use by Tabard Theatre, San Jose – Dublin Sister City Program, Celtic Society of Monterey Bay, AmeriCeltic, and Black Brothers Band. Magnanimously hosted by Trinity Cathedral, 81 N. 2nd St., San Jose CA, the Black Brothers Band returned to San Jose. In partnership with AmeriCeltic, the San Jose-Dublin Sister City Program proudly presented Shay & Michael Black, the singing siblings from Ireland’s foremost family of song, The Black Family, with a special appearance by Celia Ramsay in duo with Shay. A full house spent an enchanted evening with the charismatic charmers from Dublin. Celia Ramsay and Shay Black sang selections from their collaborative album, ‘Singer’s Request’. This seminal work includes instrumental support from John Doyle, Liz Carroll, Michael Black, Patrice Haan, Charlie Hancock, Eamonn Flynn, David Morris, David Brewer and Rebecca Lomnicky and vocal harmonies on some songs from Shay’s family: niece Róisín, sisters Mary and Frances, and brothers Michael and Martin.